Yes, it's only September, a time of year where the only meaningful games are being played on ball diamonds and football fields, yet when Calgary loses to Edmonton in anything -- crokinole, tetherball, water polo, never mind hockey, it always matters. The Flames opened up the NHL pre-season Monday night exactly how they opened up the pre-season a year ago, with two losses on the same night to their rival three hours to the north. For fans, losing in two's to the Oilers has become a bad habit of late. Following the split-squad losses last year, Edmonton swept the home-and-home to open up the regular season. Then in January, on consecutive Saturday nights, again it was the Oilers that prevailed on both ends. Add in losses in Penticton at the last two rookie tournament meetings and the last 10 times players wearing Flames sweaters have taken to the ice in a match-up against players in Oilers sweaters, it was the orange and blue that triumphed. Like the warnings on packs of cigarettes, watching games with Edmonton these days should carry a label warning Flames fans of the risk to their health. Caution: Watching the Battle of Alberta may stunt your happiness. There's over two weeks still before the two sides meet again for real. They open the regular season against each other on Oct. 4 at Rogers Place. There's still plenty of time for Glen Gulutzan's crew to get their act together but Monday's meager efforts hardly instilled much confidence in a fragile Flames fan base still suffering PTSD from how last year's lopsided season series went. Oilers fans, after all, as if the years 2007-2016 never happened, are chock full of swagger these days. They will rarely pass up an opportunity to poke fun at their provincial rival. The worries -- insert surprise-face emoji here -- begin in net. Tearing down and re-building the crease has become an annual summer project for Flames GM Brad Treliving. Like weeding the flowerbed. This summer's trip to the garden centre landed him Mike Smith and Eddie Lack. But a lot more sunshine and water is needed because both are looking wilted after last night. In Calgary, Smith was beaten four times on 13 shots. In Edmonton, Lack surrendered three goals on 23 shots. Combined, the new-look tandem sport a 7.10 goals-against average and a .805 save percentage for their combined 59 minutes of work. The first number will come down. The second number will go up. Is it a microscopic sample size? One hundred percent. But considering the importance of the position and the club's recent history at the position, it should be no surprise that fan anxiety is already revving at very high RPMs. Smith was philosophical about the rocky start. At 35, he knows better than to dwell on a half-game of hockey in mid-September. Yet if this was a first date with the C of Red, there would have been no good-night kiss at the end, nor any swapping of phone numbers. Five minutes in, Drake Caggiula's deflection slowly trickled over his pad. Five minutes after that, Yanu Auvitu's 40-foot slapshot off the wing again went off his pad and in. Just like that, murmurs of disdain could be heard from the lower bowl. After Micheal Ferland loses the puck along the boards, Jujhar Khaira strolls to the face-off dot and whistles a shot over Smith's glove. Great shot, but this is a fourth line player with one goal in 25 NHL games, not exactly a sniper. But the blame goes well beyond Smith. It wasn't a gem of a performance from the Flames out-of-synch back-end either, despite Calgary rolling out their vaunted top-four. 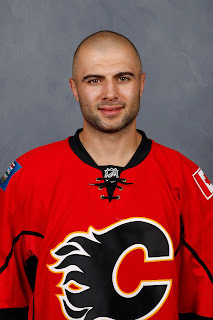 Impersonating Nicklas Grossmann, normally trustworthy Mark Giordano served up a meat-lover's pizza for the fifth goal early in the third that restored Edmonton's three-goal cushion. Kailer Yamamoto graciously accepted the freebie in the slot -- that came with a free order of cheese bread -- and buried a shot behind Jon Gillies. As for Travis Hamonic and TJ Brodie, let's call it a work in progress. Roseanne Barr and MC Hammer have better chemistry at this point. Again, not a reason to be concerned yet, it's one game together and heck, training camp only opened four days ago. But it's an indication that it's going to take some time. Hamonic needs to get to know his new D-partner (and vice-versa) while also getting familiar with Gulutzan's defensive system. You'll recall how long that took the others last year. It was a rough night for Brodie in particular, who got beat a couple of times and looked more like a guy auditioning for the sixth or seventh D job than a guy that should be anchoring the second pairing. For fans, the two highlights of the night came very early and very late. Before many were in their seats, Sean Monahan took a nice feed from Ferland, looked off Johnny Gaudreau on the ensuing two-on-one, and wired a shot under the crossbar. On the first shot of the game, just 1:01 in, Calgary led 1-0. Then, with many fans already heading for their cars or the LRT, the nicest goal of the night was authored by Mark Jankowski with 54 seconds left. Spark plug Dillon Dube with some terrific work down the left side to outmuscle a defender and then zip a pass in front to Jankowski, who sniped the shorthanded goal. But in between, lots of dreg from the home side and by lots, I mean lots. It's too early for panic. Too early for angst. Too early for the nerves to be frayed. It's way too early for all of that. But losing to Edmonton will have that effect. To paraphrase one of Bob Hartley's favourite sayings, if Monday night was the balloon party after the Flames offseason moves left many fans brimming with optimism, the Oilers were the porcupines that showed up at the door uninvited. The first round of cuts were announced today, which is a day off for the team. Twenty-one players with no real surprises were trimmed, leaving the camp roster at 47. With camp down to two groups now instead of three, Wednesday brings another chance for Calgary to redeem itself against the 'B' cast (or 'C' cast) left behind by Vancouver while most of the Canucks stars are in China for the two-game showcase with Los Angeles. It will be a night in which the result doesn't matter, unless they lose. Take one on the chin to the undermanned Canucks and widespread panic will really set in -- not Defcon 1 level, but Defcon 4 or 5 would be about right. It's ridiculous, it's over the top, but as social media has proven out repeatedly, when you're talking Flames-Oilers or Flames-Canucks, rational perspectives are the exception, not the norm..
Good read because it mirrors every fans feeling from all the over-hype from the summer. I am not worried in the least about Smith until he start to show Elliott like tendencies. But Lack is questionable and I wish we could give Gillies a shot and have Parsons and Rittich down in Stockton. I thought the best player last night was Dube and I can't wait for him to make the team. I also like Janko and Mange and hope they get some meaningful games. I think Dube has a bright future. I really like his game. Jankowski looks really close if not ready and Mangiapane is coming along nicely. There are kids coming and the line-up is already young. Should bode well for sustained success, emphasis on "should". Main reason for the double losses: Oilers ran scrimmages each day of their camp, which gave them plenty of practising line rushes an defending them. As well the goalies in scrimmage saw some quality shots in a game-like situation. The Flames? No scrimmages, goalies go no shots.....enough said. Another teaching moment for GG: don't go this unprepared to face the oilers! Pre-season....Don't worry about our goalies; skaters have been on the ice with fellow hockey players for months now, not so for the goalies. Unprepared to face the Oilers and have success maybe, but I think Gulutzan has greater priorities than pre-season results so while it stinks for fans, and the club would like to win, as you said, if that was really the main focus, they'd do things differently. Instead, we'll reserve judgement to see how they fare in the actual games that count. Flames had a great start to the season in 2014-15 when it was all about high pace, high intensity training camp with lots of skating and scrimmaging. The next year, 2015-16, Treliving had Hartley tone it down. Slow start. The next year, Hartley was replaced by Gulutzan, who is basically the coach version of Treliving. But the first three days of practices did involve plenty of intensive skating to the point where guys were lined up in the medical room. Tkachuk's injury most notable but they were others that tweaked things in the legs from all the skating. Add the poor effort and results against the Canucks and many are wondering whats wrong. Tonights game against the Yotes had better be better or the fans might revolt.